Yesterday the mighty West Indies opener Chris Gayle smashed 16 sixes and 10 fours to score 215 against Zimbabwe in a Pool B game. This became the highest World Cup score, beating the previous best of Gary Kirsten of South Africa, who made 188 against the United Arab Emirates in 1996. His last world cup century came in 2003 against Kenya. In his total 23 match outings, Gayle has scored 859 runs at an average of 39.04. All this and many more cricketing data is hosted on the ESPNcrickinfo’s latest offering Insights. 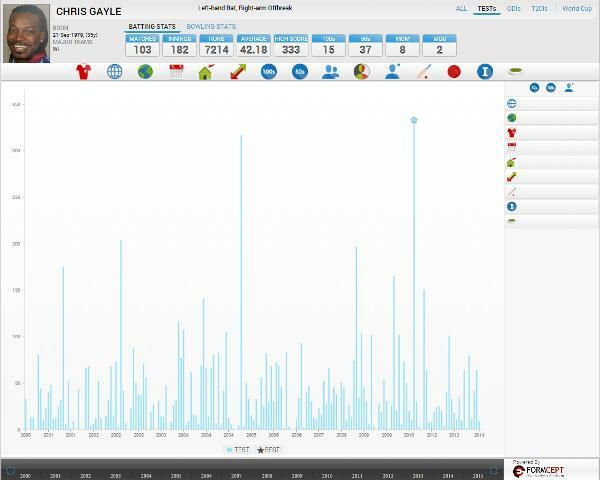 The below screen grab gives a quick overview of the century’s scored by Gayle in Cricket World Cup since 2003. The company, which claims to have the largest digital and editorial operations for cricket globally, introduced a tool named ‘Insights’ with the start of the ICC World Cup 2015 by blending big data analytics with cricket. ESPNcricinfo Insights uses more than two decades worth of world cricketing data points and statistics, mapped at the data and analytics hub in Bangalore, to create an interesting suite of products that aim to engage fans in this multi-screen era. The company further adds that using the tool one can predict the probability of Virat Kohli playing in a certain zone against a particular left-hand bowler. For cricket teams, who will essentially require a deeper analysis, the product is being made available as a subscription-based service. “It is a pioneering initiative in the cricket coverage space and is sure to delight fans during the upcoming cricketing season. It will be of interest not just to cricket fans but also various other stakeholders in cricket like players, coaches, analysts,” Ramesh added. The Big Data operations map close to 25 dynamic variables for every ball bowled during a match that is put through an extensive analytics process that is supplemented by historical data as well as the resident cricketing intelligence of the global ESPNcricinfo editorial team. Along with visually appealing data, ESPNcricinfo is packaging insights via video with thoughts from experts. For example the latest post in the Insights section is a 4 minute long statistical analysis video of centuries scored in first innings in this World Cup compared to ones scored in the second innings video. This set of videos are a combination of insights driven from data wrapped with thoughts from a cricketing expert. The recent impressive century from Shikhar Dhawan against South Africa was a part of this video series. The video tells that Dhawan has shown a consistent performance overseas in ODIs. Which mean good news for Indian cricketing fans for the forthcoming matches. To get people to know about its latest offering, the online destination for cricket has been tweeting interesting insights during match time; below tweets are some of its efforts. For building the comprehensive and visually appealing insights from the available data sets, ESPNcricinfo has partnered with Formcept India – a Unified Data Analysis platform that helps enterprises to get actionable insights from their data faster. The product is also powered by Epson India.